The Boca Raton Holiday Boat Parade is one of several held throughout South Florida during the Holiday Season. We had just “Whipped it Good!” at the Seminole Hard Rock Winterfest Boat Parade in Ft Lauderdale a week earlier! The Boca parade is smaller but with a much more personal feel. Human powered watercraft are not excluded, and it’s possible to ride into town in a kayak! “Kayak Ted” of the Palm Beach Water Yaks meetup group once again organized a paddle of the 2018 Boca Raton Holiday Boat Parade. The Boca Raton Holiday Boat Parade runs about 5 miles from the C-15 Canal down to Lake Boca Raton. 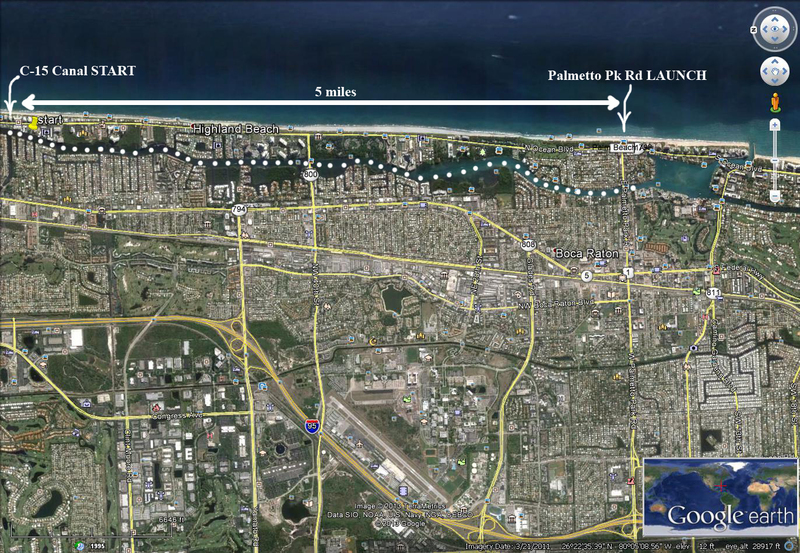 We paddle twice the distance since we start and end at Palmetto Park Rd. 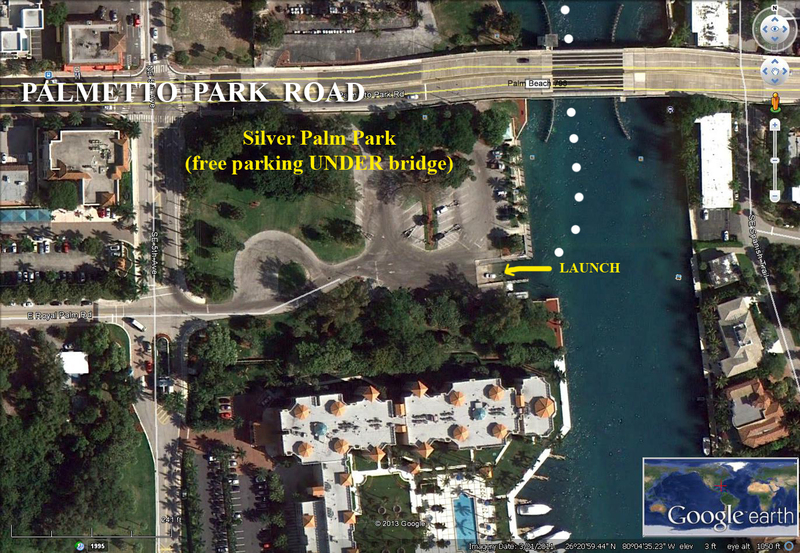 Public boat ramp launch and parking at Silver Palm Park on the north end of Lake Boca Raton. As in previous years, we would be to launching at Silver Palm Park, off Palmetto Park Rd. This is a public boat ramp with free parking under the bridge. It’s best to get there early to find limited parking under the Palmetto Park Rd bridge. “Red Rum” – my Nigel Foster Silhouette sea kayak decked out for the Holidays! But where is the Alien Jr. ? Launching into the ICW at the Silver Palm Park boat ramp. GREETINGS! Yippie yi yaaaay, Yippie yi ooohhh! We are off and paddling up to the Parade staging area. Paddling up the ICW on the late afternoon sun past the Gumbo Limbo Nature Center. Merry Christmas and Holidays lights!! In the golden sunlight we pass Spanish River Park where folks are lining up to watch the Parade procession. Kayak Ted and daughter Olivia in front of Spanish River Blvd. 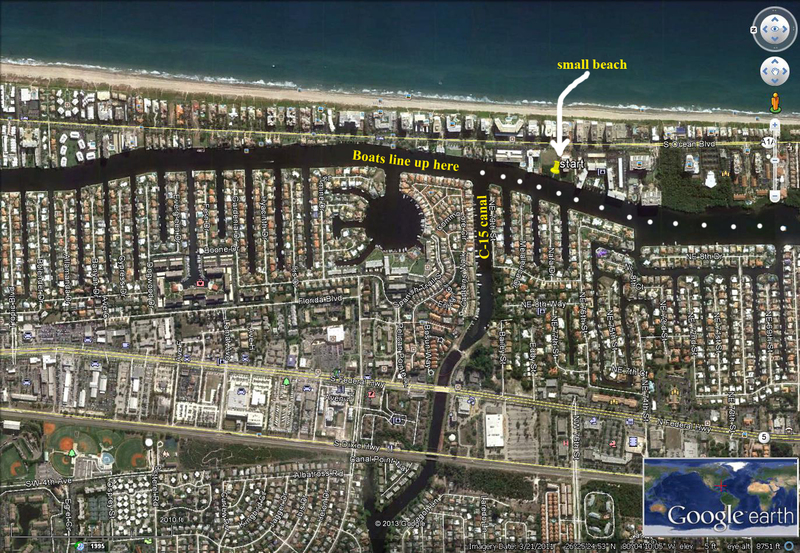 The Boca Raton Holiday Parade runs down the Intracoastal Waterway, starting at the C-15 Canal on the northern Boca Raton city boundary all the way south to Lake Boca Raton. We paddle the five miles due north to join up with all the other boats and then those same five miles back down with Santa Claus leading the Parade! There is a tiny lil beach on the ICW where we regroup and prepare for the Parade. This year due to time constraints we stopped about a half mile short along the big wooded area where the low tide created some space. Kayak Ted in the making of a Santa Claus! Oh my, what interesting undies you have Santa! And just like that, a paddling Santa Claus is made! Season’s Greetings Earthlings from Alien Jr. who will accompany Santa on his journey through Boca Raton! “Red Rum” ready to ride the 2018 Boca Raton Holiday Boat Parade. This year I borrowed Kayak Ted’s custom color changing LED lights! Santa is off and paddling into town! Santa and Olivia paddling down the ICW in Boca Raton. I adopted an Elf / Grinch persona with four loud whistles for the Parade. What?! Santa paddles past a waterfront mansion in Boca Raton. Sadly, there were few decorations this year and reduced festivity levels~. Olivia paddles the darkness in a P&H Scorpio sea kayak. As usual, we led the parade again this year and really enjoyed ourselves spreading good Holiday cheer to all! Kayak Ted as Santa Claus, paddling into town! Santa looking good at the 2018 Boca Raton Holiday Boat Parade. Weaving our way around the boats anchored in Lake Boca Raton. Holiday fireworks over Lake Boca Raton. Santa watches the full moon rising over Lake Boca Raton. Yes we had a big ol’ full moon just before Christmas! One of the nicest boats of the Parade “Too Much Fun” back at the boat ramp. We had a relatively easy paddle, cruising down the ICW of the parade route. However as we paddled further down south closer to Lake Boca Raton we encountered progressively more resistance due to the incoming tide. By the time we were under the Palmetto Park Rd bridge, we were going straight into a pretty strong current. The waterway is constricted under the bridge which results in a funnel effect and a good 4 or 5 knot head current as the “lake” is fed directly from the ocean. Very tricky paddling here – use extra caution! Back at the boat ramp at Silver Palm Park. It wasn’t long before Santa was spotted by the kids ..
A “get your picture with the kayaking Santa Claus” session ensued! Kayak Ted as Santa Claus was the hit at the end of the Boca Raton Holiday Boat Parade! The Boca Raton Holiday Boat Parade has a very family friendly vibe and crowd, with good cheer for the Holidays to all! A BIG thanks to Kayak Ted, Olivia and the City of Boca Raton for a fun and enjoyable evening paddling into town! © 2019 Flex Maslan / kayakfari.com / awakenthegrass.com. All original photographs, artworks and music in this portfolio are copyrighted and owned by the artist, Flex Maslan, unless otherwise noted. Any reproduction, modification, publication, transmission, transfer, or exploitation of any of the content, for personal or commercial use, whether in whole or in part, without written permission from the artist is strictly prohibited. Fantom face – new look with total UV sunblock protection.